The economy of the nation is in a messy state right now. The cash reserve of the federal government is not bountiful any more. The economy of the nation is in a messy state right now. If reports are to be believed, the country's Gross Domestic Product (GDP) rate increased only 1% in the second half of the 2011. The cash reserve of the federal government is not bountiful any more. The debt ceiling controversy made this point more than clear to everyone. Can the situation get worse than this? Probably yes. 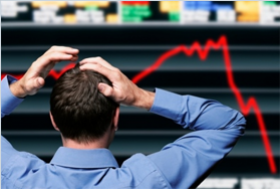 The financial experts are predicting that another market crash is looming in the country. This means that the American citizens can face another recession and financial tumult soon. Read on to know about the financial moves you can make when another market crash is looming in the country. It does not hurt to take safety precautions beforehand. 1. Apply for a credit card and secure one: If you are planning to take out a card for yourself or your kid or anyone else, then it is better to submit the application to the credit card company now. The credit card terms and conditions are expected to get tougher. Do comparison shop and take out the credit card from the one offering a favorable deal to the consumers. 2. Take advantage of refinancing: The mortgage rate of a 30-year FRM has dropped to 4.29% from 4.41% in the third week of September 2011. On the other hand, the rate of the 15-year FRM has dropped to 3.42%, which is a 0.08 decrease from the previous rate. The required monthly payments of these 2 mortgages have fallen by $2.9 and $1.6 respectively. So, if you're going through financial hardship and struggling to make the required payments, then this is the best to go for refinancing. 3. Re-evaluate your family budget: As it has already been said, the economic state of the country is not good. The present market condition is most likely to get worse. This is terrible news for the middle class men of the country. It is hard to forget what happened to the personal financial condition of the consumers during the recession period. If another recession comes, then it means that the unemployment rate will get higher and the people may lose jobs. Your employer may ask you to leave your job one day without giving a prior notice. This is why it is crucial to build a cash-reserve enough to meet your family expenses when you don't have any job. Re-evaluate your family budget and determine whether or not it is helping you to save a decent amount of money each month. If not, then you need to trim down your expenses. Analyze your budget and find out the areas where you or your family can potentially save more. 4. Make investment in gold: You need not to be a financial expert to know that gold investment can help you make money within a short period of time. The hype surrounding gold prices have reached sky high in the last few months. Dozens of articles are written in the financial websites, newspapers and magazines about the benefits of investing in gold. However, very people are actually investing in the gold nowadays.The gold price has decreased by around $200 in the month of September 2011. Take advantage of this opportunity and invest in gold. The price of gold may increase soon. 5. Take advantage of college savings account: After the enactment of the Budget Control Act, the federal student loans may become scarce in the near future. This means that students will face difficulties in getting government financial aid. So, if you were banking on the federal student loans to sponsor your child's college education, then this is a wake up call for you. Create a college savings account for your child and contribute money to it each month. Make big contribution to the savings account. This will help you meet the college expenses of your child without facing any major financial hurdle. 6. Purchase stocks of good companies: The blue chip stocks always perform well irrespective of the condition of the stock market. So, you can invest your hard earned money in the blue chip companies without thinking twice. You can get good dividends even when the stock market is going through a lull period. Once the market recovers, you can make a huge mount of money through these stocks. 7. Get rid of small stocks: The price of the small-cap stocks have dropped considerably. If you are incurring loss on the small cap stocks like others, then it is better to sell them. You can use the money received from the sale proceeds to purchase some good stocks. You'll recover the loss and reap profits in the long run. If you don't want to invest, then keep it in your savings account. 8. Increase your retirement funds: The funds in the retirement accounts (401k and IRA) are shielded from the creditors and taxes. So, contribute money in the retirement accounts to protect your financial future. If possible, increase your contribution to these accounts. Finally, you can liquidate some treasury bonds as the yields are getting lower. Sell some of the bonds and invest somewhere else. If the prediction of the financial experts comes true, the yields may go even lower. Page loaded in 0.587 seconds.